USAF Tech. Sgt. 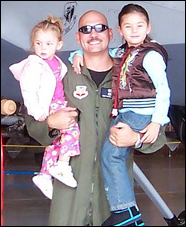 Daniel Beesting joined the Air Force in February of 2002, just months after the September 11, 2001 attacks. He served the country from 2001 to August of 2011. His unit first deployed to Iraq in 2004. Tech. Sgt. Beesting spent a lot of time with Remotely Piloted Aircraft (RPA) operations during Operation Iraqi Freedom and Operation Enduring Freedom. Tech. Sgt. Beesting, who suffers from PTSD, hearing loss, insomnia, tinnitus, sinusitis, and foot injuries, has an 80% disability rating. He earned the Aerial Achievement Medal, Air Force Achievement Medal, Meritorious Unit Award with one oak leaf cluster, AF Outstanding Unit Award, AF Good Conduct Medal with two oak leaf clusters, National Defense Service Medal, Global War on Terrorism Service Medal, AF Overseas Ribbon Long, Air Force Expeditionary Service Ribbon with Gold Border, AF Longevity Service with one oak leaf cluster, USAF NCO PME Graduate Ribbon, and the AF Training Ribbon. Tech. Sgt. Daniel Beesting, wife Alicia, and their three children, received a home in Rotonda West, Florida. The Beesting Family would like to reside in the Rotonda West area.